blooom is unique among robo-advisors because it specializes in helping investors manage employer-sponsored retirement plans automatically. Like other robo-advisors, blooom Inc uses computer algorithms to build retirement portfolios. And it goes a step further by connecting customers to financial advisors, who are available by chat, email, and phone during weekdays. During our blooom review, we were pleasantly surprised to discover that the cost of managing a 401(k) is just $10 per month. The flat fee is compelling, especially when you consider that most other robo-advisors steer clear of defined contribution plans. And unlike some robo-advisors, blooom won’t penalize newcomers with any account minimum hurdle. In fact, when you weigh up the pros and cons, it’s easy to see why blooom offer tremendous value. 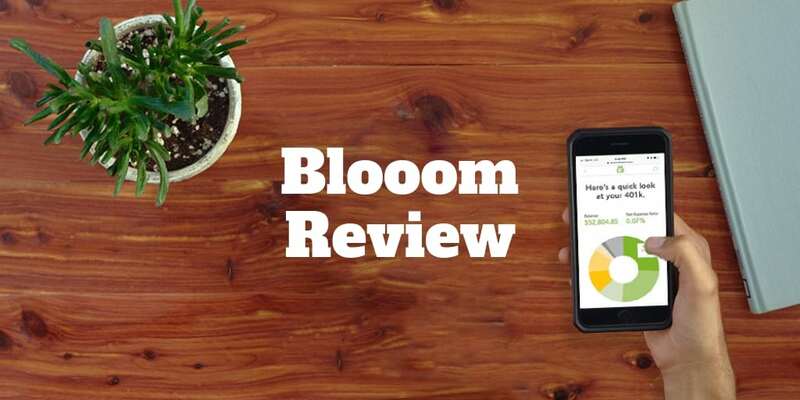 blooom Review: Is It Right For You? How Are blooom 401k Portfolios Invested? You can create a blooom account and connect easily to your existing 401(k), 403(b), 401(a), 457 or TSP plans. blooom will then analyze your portfolio for free. If you are not sure whether your portfolio is optimized for your age, risk, and goals, blooom evaluates it using proprietary computer algorithms at no cost. Although blooom can analyze and make changes to your portfolio, it cannot withdraw funds from your account. Once your account analysis has been completed, blooom factors in your age and timeline to retirement in order to build a target portfolio for you. After blooom reviews your portfolio composition, it recommends investments from up to 14 asset classes. Where blooom adds value to you is by crunching through thousands of options to select the optimal investment in each asset class to meet your needs. Usually, low-cost index funds are favored but every once in a while blooom will select an actively-managed fund if it is a better match for your risk level and retirement goals. Finally, blooom reviews your portfolio to ensure the portfolio built by its algorithms is indeed a match for you and fund changes are made. Every 90 days, your portfolio will be re-analyzed to ensure portfolio weightings align with your capacity for risk and financial goals. And each time a change is made, blooom alerts you to the funds which are replaced. blooom is designed for price-sensitive investors who want to hand off portfolio management to a financial advisor. During the onboarding phase, you will be invited to enter your birthday and specify when you plan to retire. With this information, blooom knows your age and the duration before you retire. It then constructs a portfolio to match your capacity for risk and financial aims. blooom leans somewhat aggressive in its portfolio composition. Equities are weighted heavily until about 20 years out from retirement when bonds feature in the mix more prominently. Because of the higher exposure to stocks, blooom is ideal for investors who are more risk-seeking than risk-averse. Many research studies have shown that investors who receive professional financial advice outperform those who invest alone. The reason so many investors fall short of the mark without advice is because, according to blooom, they make three major errors. The first is to build a portfolio of bonds and stocks that have an incorrect mix compared to their risk tolerances and financial goals. Next, investors frequently fail to diversify their 401k plans and instead invest heavily in a single company. Usually they are biased towards investing in the company that employs them. And lastly, they don’t want to face the challenge of managing their retirement accounts, so they stick their heads in the sand like an ostrich! For investors who see the value of expert financial advice and care about the cost of receiving it, blooom is hard to beat because it charges a low monthly fee. For a flat fee of $10, blooom will identify areas of improvement in your existing 401(k) portfolio, make changes, and provide ongoing management of your existing portfolio. Unless you pay a financial advisor a much higher fee (most likely), blooom is a compelling alternative. Not only is it an excellent option for investors who don’t want to pay a dedicated financial advisor, but it is also unique among robo-advisors. Few robo-advisors dabble in 401(k)s because they can be a nuisance to manage. Each employer has its own set of limited securities in which employees can invest and it’s a difficult challenge to automate portfolio management of defined contribution plans. For this reason, even the robo-advisors who advise on 401(k) plans, like Personal Capital, won’t manage them for you. In fact, if you want your 401(k) plan managed automatically, blooom is really your only option. According to blooom, the average client could save over $60,000 in hidden fees over their working life based on a balance of $43,310 and an average annual contribution of $5,000. The average pre-blooom client pays an investment expense ratio of 0.73% annually and a post-blooom expense ratio of 0.32% per year. The lifetime savings by choosing blooom amount to an astonishing $60,000 in fees based on an average balance of around $43,000. To save you so much money, you might assume that blooom costs a fortune but in fact the flat monthly fee is very affordable, especially for large accounts. A client with a six-figure portfolio of say $100,000 pays just $120 per year, which amounts to an annual cost of just 0.12%. Compared to traditional financial advisors or other robo-advisors, this fee is very competitive. A client who invests say $20,000 will pay the same $10 per month or $120 per year, which amounts to an annual fee of 0.60%. That still compares well to a human advisor but it’s higher than Betterment and others charge to manage IRA and taxable portfolios. The gotcha is the only place to manage your 401(k) automatically is blooom so choosing another robo-advisor is not a viable choice. In our view, the fee is fair given the unique service blooom offers and the fact that clients have access to live advisors by email, chat, and phone. blooom analyzes your existing 401k, removes portfolio holdings that don’t align with your objectives or cost too much, and replaces funds with others that better align with your target allocation and financial aims. blooom analyzes your existing 401k and remove funds that don’t make sense. To keep fees low, blooom generally selects index funds but, every once in a while, actively-managed funds are chosen. After selecting funds that align with your target allocation, computer algorithms select investments to optimize for expense ratios and fund manager experience. Finally, blooom verifies the results and compares the new portfolio with your recommended 401(k) allocation. Every 90 days thereafter, your portfolio is re-analyzed to ensure selections and weightings are optimal. If needed, your portfolio will be automatically rebalanced. As you come closer to retirement, blooom will automatically modify the weighting of stocks in your portfolio to create a more conservative portfolio. You can link an existing 401(k) account to blooom in order to measure fees, and evaluate its composition, and allocation. blooom makes it simple to analyze an existing 401(k). Simply link to your existing provider after setting up your blooom account in order to view how well your current 401(k) is performing. Hands-off investors can leave it to blooom to manage their 401(k) while self-directed investors can act on the recommendations provided. Where blooom earns a few extra brownie points is its risk tolerance assessment. Risk tolerance measures are factored into the sign up process using an adjustable slider that allows you to change your allocation by up to 20% either way from the suggested allocation. blooom charges a low, flat monthly fee. The onboarding process is easy and it’s free to analyze your existing portfolio. If blooom were to be docked a few points, it would be the high fee as a % of assets under management on smaller account sizes. ✅ Low Management Fees: blooom charges a flat monthly fee of $10, which is a steal when compared to the costs charged by traditional financial advisors to manage defined contribution plans, and compares favorably to the fees charged by other robo-advisors. ❌ Large Cash Holdings: blooom structures portfolios with heavy weightings of equities which doesn’t account for the differing risk tolerance levels of clients and caters more towards risk-seeking than risk-averse investors. ✅ Financial Advisors: Clients have access to financial advisors by email, phone and live chat during weekday business hours. ❌ Small Account Sizes Penalized: While fees are low as a % of assets under management for large account sizes, they are not insignificant for small account sizes, though still generally competitive when compared to traditional financial advisors, who often charge north of 1%. ✅ Automatic Rebalancing: When fund weightings drift too far from the recommended allocation, blooom rebalances the portfolio. Automatic rebalancing is done every 90 days. ✅ 401(k) Assessment: blooom makes it easy to link to an existing 401(k) in order to assess whether expense ratios can be optimized and portfolio compositions can be improved. ✅ No Account Minimums: blooom allows clients to sign up with no account balance minimum. blooom imposes no account balance minimum, charges a $10 flat monthly fee for account management and automatic rebalancing. 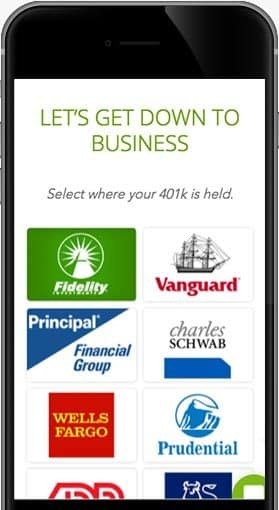 blooom supports employer-sponsored plans: 401(k), 403(b), 401(a), 457 and TSP. Unlike most robo-advisors, which focus on taxable and IRA accounts, blooom is unique because it manages 401(k) plans automatically for a low monthly flat fee. By imposing no account minimum, blooom makes it easy to get started. And by charging nothing to analyze your 401(k), there is no reason not to give it a whirl. If you are like the average blooom client, you will experience instant fee savings and, over the life of the account, potentially save as much as $60,000. The bottom line is if you have a defined contribution plan, like a 401(k), 403(b), or 401(a), blooom offers compelling value at a fair and flat monthly rate.